The Multipure AquaRO combines Multipure's advanced solid carbon block filter with reverse-osmosis filter technology, resulting in our most complete water filtration system available. Because of its size and complexity, the AquaRO can only connect below the sink; the install kit is included. The Multipure MP750 Plus RO is the only device certified under NSF/ANSI Standards 42, 53, and 58 to reduce: Nitrates/Nitrate, Arsenic V, Chloramine, PCBs, Toxaphene, Chlordane, Lead, Mercury, Fluoride etc. Multipure's MP750PlusRO Unit includes pre-filter, RO membrane, and Multipure’s Model MP750SB as a post-filter, giving you the highest quality water possible. Multipure’s MP750 Plus Reverse Osmosis System features FIVE Stages of filtration giving you performance that no other device can provide. By combining Multipure’s superior carbon block filter technology with state-of-the-art reverse osmosis, you will receive the highest quality drinking water possible. Stage 1: The Sediment Pre-Filter screens out particles down to 5 microns, improving the appearance of your water. Recommended filter change (Model No. CBC110): approximately every 6 months. The water passes through two 5 micron Carbon Block Pre-Filters reducing the presence of chlorine and other materials that can negatively affect the taste and smell of the water.-- Recommended filter change (Model No. CBC112): approximately every 6 months. Stage 4: The RO Membrane separates unwanted inorganic impurities, such as nitrates and fluoride, from the water. 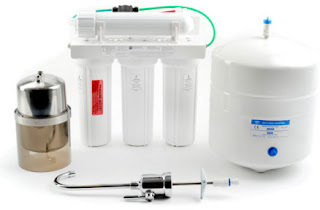 Thais ultrafiltration membrane reduces salts, certain heavy metals, and other impurities. Recommended membrane change AquaRO - RO Membrane approximately every 2 years. Stage 5: The Carbon Block Post-Filter mechanically intercepts particles as small as 0.5 microns, electrokinetically absorbs particles, and physiochemically absorbs many organic chemicals, pesticides, herbicides, and certain heavy metals. Recommended filter change (Model No. CB6): approximately once a year.